﻿﻿﻿﻿Foundation helps TPWD build hatcheries, train game wardens and conserve game. ﻿﻿Dawn broke with a light mist falling on the South Llano River near Junction. It was May 9, 2013, and the hot days were already telling of oncoming summer. The cooling rain was a welcome respite for a little flotilla of kayakers putting in to the spring-fed stream. Leading the group was Tim Birdsong, a Texas Parks and Wildlife Department rivers expert who’s pioneering a new watershed-scale approach to conservation. Birdsong is part serious scientist, part river rat and part fishing aficionado. He has a rare talent among such folk: the ability to find big dollars for big projects. By his side that day was Pat Robertson, a donor brought to the river by the Texas Parks and Wildlife Foundation, the state agency’s official nonprofit partner. Like Birdsong, he grew up rambling on a family farm as a boy. He never lost a love for the outdoors, despite his work as an investment adviser. As the morning flowed by, Robertson and the group paddled downriver, shooting over small waterfalls of white foam in places. Nearby were Anne Brown, foundation executive director, and her right-hand fundraiser Susan Houston. Spirits were high. It was an up-close and personal chance to sense the soul of a river. Occasionally the kayakers drifted and cast fishing lines into the clear water, and Robertson reeled in a Guadalupe bass, the feisty little state fish of Texas. Once common to Hill Country streams, they’re threatened today by hybridization and threats to their river habitats. 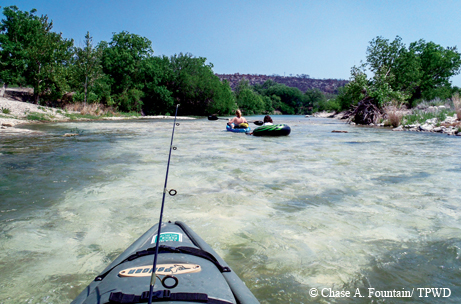 ﻿﻿The South Llano River has been a focus of recent TPWD conservation efforts. The agency and its partners are improving habitat, encouraging recreation and stocking Guadalupe bass. Stocking the South Llano with Guadalupe bass is one element of a plan put in place by the South Llano Watershed Alliance, which facilitates river conservation and restores habitat with help from university scientists, conservation groups, riverside towns and others. A big chunk of this is federal money, which necessitates the acquisition of matching private donations. Yet, Birdsong emphasized, chasing the money is just a means, not an end. Back up more than two decades, to 1991. That’s when the foundation was born through the vision and will of several leaders, including Andrew Sansom, agency executive director at the time, and Ed Cox, former Texas Parks and Wildlife Commission chairman. 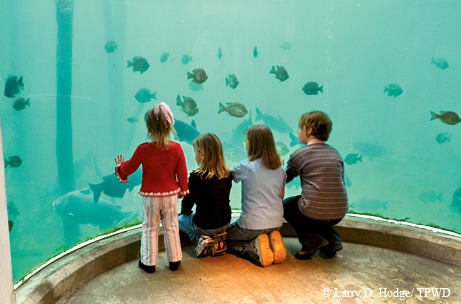 Cox helped lead the foundation’s first big project: funding the Texas Freshwater Fisheries Center, a combination fish hatchery and tourism and educational center. In an ingenious first, they invited communities to bid on hosting the facility, lured by the promise of jobs and tourism. ﻿The Texas Parks and Wildlife Foundation’s first big project was construction of the Texas Freshwater Fisheries Center. In those days, few department employees knew much about fundraising. The foundation changed that. Indeed, although the Athens facility is the foundation’s oldest big project, it remains one of the most enduring and successful. The foundation’s ability to move quickly, faster than government, is often cited as a vital strength. When it comes to state parks, the foundation’s finest hour may have come in December 2010, with acquisition of the Devils River Ranch. The department had originally proposed a “land swap” to trade the existing Devils River State Natural Area for the new 18,000-acre property farther downriver. But after objections about loss of existing parkland threatened to derail the deal, in a matter of weeks the foundation raised $11 million in private donations to help buy the new tract and keep the existing park. Earlier that same year, the department opened a new Game Warden Training Center in Hamilton County, replacing an aging facility in Austin. The foundation invests in people, too. In 2012, TPWD’s Law Enforcement Division began a forward-looking expansion of its special ops teams, under director Col. Craig Hunter. That includes functions like search and rescue, boat accident investigations and the agency’s first-ever K-9 corps. ﻿﻿Private donations raised by the foundation paid for development of a K-9 corps and construction of a new Game Warden Training Center. 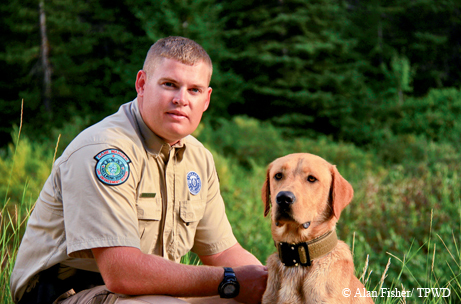 By outreach, Jones partly means recruiting a more diverse workforce among game wardens. Just as the historically rural department is trying to engage a new generation of Texans in big cities, the foundation connects urban money to conservation out where the deer and the antelope play. With a governing board of 21 trustees overseeing seven full-time and two part-time staff members, the foundation has raised more than $80 million since its inception. This success has spawned imitators at river authorities and other state agencies. But the department may have a unique advantage. That feeling is echoed by long-running foundation board member Pat Murray, who also leads the Coastal Con­servation Association. Though it may not be well-known to average Texans, the work of the foundation touches many lives.